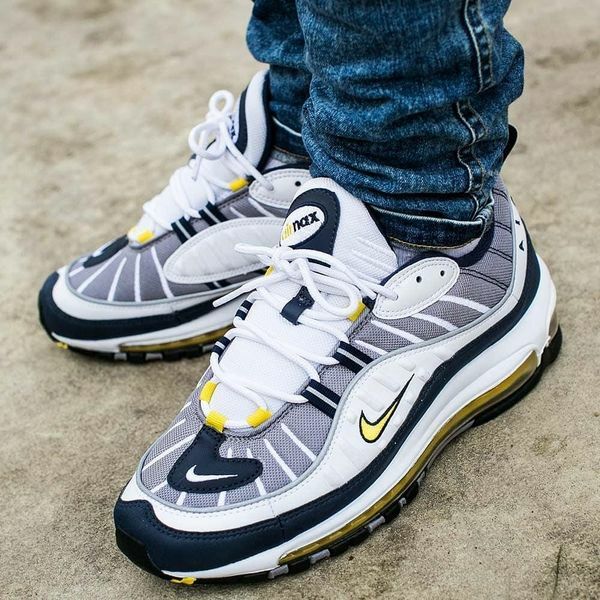 Created by Sergio Lozano in far 1998, Nike Air Max 98 is making a great comeback in 2018. As this year marks the 20th anniversary of the model, the company decided to relaunch the Air Max 98 silhouette just like it did last year with the 97. Despite Nike Air Max 98 has always suffered from the competition with multiple Air Max sneakers released before the 98s (Air Max 95, Air Max 1, Air Max 90, Air Max 97, etc. ), and the fact the Nike Air Max Plus, which also was released that year, made everyone forget about Air Max 98, the 2018 edition of the model has already become one of the main Nike’s events of the year. During January, February, and March, lots of Air Max 98 colorways were released, including the classic “Gundam”, “Tour Yellow”, “Fossil”, “Gym Red”, basic “Triple White” and some other options. However, it’s not the end. So, what does this year promise? The company is expected to revive at least 6 other colorways during the spring and summer, and several updates are rumored to come in autumn too. Intrigued? Scroll down to see the best 2018 iterations of the Nike Air Max 98! This clean and smooth silhouette is expected to come in mid-April but it’s already gathered hundreds of fans around. Great for warm summer walks and challenging gym workouts, this model is a blend of style, comfort, and wisdom of the years. They are dope, agree? This cool light khaki colorway is one of the new options, which are going to join the lineup. Unfortunately, the company hasn’t said an exact release date of this shoe yet, but we can expect the colorway to appear on the market in April. Classic Black and White palette is boldly twisted by eye-catching Volt and Racer Blue colors in this Air Max 98. Having made a close look at the model, customers’ opinions divided: some of them were completely satisfied with the external design of the update, while others considered the Volt color to look better in the “bubbles” area of the midsole (instead of blue). And what do you think? 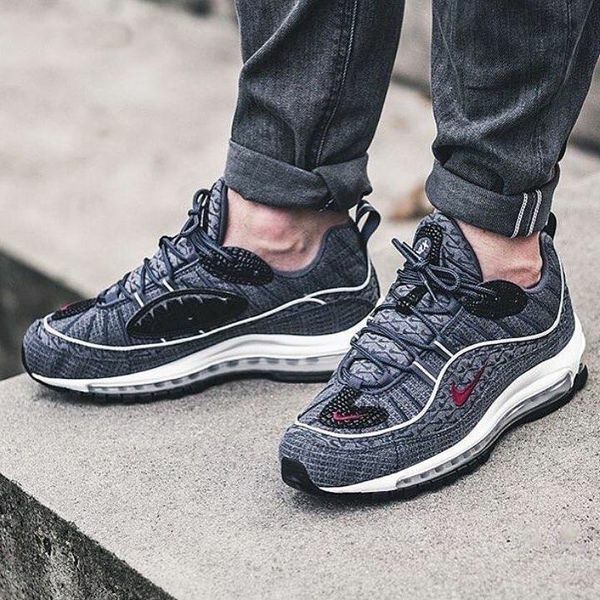 Grey and Crimson combo always works great, especially when these colors make such a streamlined silhouette like Nike Air Max 98. Such option is very versatile: for heat and cold, for rainy weather and gym workouts, for a casual walk or for an exhausting training – and all that is wrapped in style for you. This cute Nike Air Max 98 aka “Miami South Beach” borrowed the chill water-ripple look of the Air Max 97 and made a twist. Featuring a Pure Platinum upper paired with Obsidian overlays and fresh Green & Pink contrasting accents, the Nike Air Max 98 continues the South Beach theme for the upcoming season. The item will be available on the official Nike website as soon as on April, 5. Hurry up – the edition is limited! The most stylish, classic, and versatile colorway, the ‘Black/ Dark Grey/ Anthracite’ is expected to appear in May 2018. Lots of classics lovers are looking forward to the blacked-out Air Max 98. And no wonder! Black is one of the basic colors, which is impossible to combine with other colors wrong – it’s easily compatible with every single shade and outfit without any limitation. Air Max 98 Fearless 90s was one of the most anticipated colorways as it comes from the famous Nike’s OG pack. The “Tour Yellow” Air Max 98 is a mixture of bright and understated vibes: clean white overlays on a Cement Grey mesh and bright yellow hits of color. The model was successfully released in February and can still be purchased online. Classic is eternal, right? Nike thinks so, too. That’s why they decided to launch the Nike Air Max 98 Triple White along with other colorful models. No wonder this colorway was so much looked for in February and March: tonal color schemes are always a welcomed aesthetic, as it allows for the sneaker’s tooling and construction to speak for itself. Looking for bright and bold silhouette among the Nike Air Max 98 sneakers? Gym Red is what you need! This funky colorway features a predominantly red upper alongside cleaner hits of white, which go along the midsole too. However, the heel-to-toe Air Unit showcases in contrasting black. Nike Air Max Gundam is probably the most recognizable colorways of the series – no wonder it was one of the first to be released this year. It’s dressed in a classic mixture of White, Red, and Blue with hits of Black and crafted with premium material and unique detailing all over the upper to make the silhouette both eye-catching and vintage at the same time. Nothing in Nike Air Max 98 will astonish me anymore! – Bet it’s not true! How about this Nike’s idea to dress the Air Max 98 in a denim-like construction? What we’re talking about is the Nike Air Max 98 Thunder Blue. This silhouette first got unveiled towards the end of last year and the release was in early February 2018. This colorway borrows style cues from older models but looks really unique and authentic thanks to the individual detailing. Brave enough to rock your outfit with bold and bright Nike Air Max 98? If so, opt for Cone colorway. Highlighted with Aqua, Orange and Purple tones with Yellow branding, and sitting atop a White midsole and Black rubber outsole, this shoe is a crazy mixture of the most stunning colors ever possible. This pretty wild pair has been bought by a big number of people throughout the world for one month only, so it’s definitely found own fans. Well, if you’re ready to give a very fun and playful vibe to your image and like grabbing attention, this iconic style shouldn’t be overlooked. Meet the most subtle and luxurious White & Gold “UK” version of the Nike Air Max 98, which was recently revealed. This exclusive colorway features one-of-a-kind reflective detailing all over the upper construction. Probably, the most intriguing details are the Air Max logos on the medial side, ‘2018’ sign on the heel tab, and the Gold embroidered 00°00′ coordinates on the forefoot overlay and insole. Chic and trendy, the Fossil colorway of the Nike Air Max 98 was designed specifically for women. So soft and light, this sneaker is a very successful effort to revive Nike’s classic retro shoe. This colorway is rather neutral and can be considered as basic – so, it’s a must-have item in every lady’s wardrobe. The Nike Air Max 98 is offered in a great variety of cool and catchy colorways, which include both old model’s color combinations and new ones. The upper of the shoe is made of lightweight breathable mesh and synthetic leather overlays for an adapted, stable, and lightweight feel. On the outside, you’ll find a lace-up closure an external lace overlay system, which is the two lace loops located at the forefoot that will give you a more secure fit, and a pull loop on the heel part for easy on and off. You will also notice Nike Swooshes all over the upper. On the inside, you’ll find a breathable mesh lining with a removable footbed for all-day comfort. The Nike Air Max 98 stands on a two-color midsole with a visible full-length Nike Air unit, which helps to energize your every step. The durable rubber outsole gives the right amount of flexibility and traction. Versatile external design of the sneaker makes it a perfect match for a variety of activities and outfits: it can be a complement for your workout attire as well as be a part of your daily fashion resolution along with a pair of jeans, joggers, leggings, shorts, or even dresses. 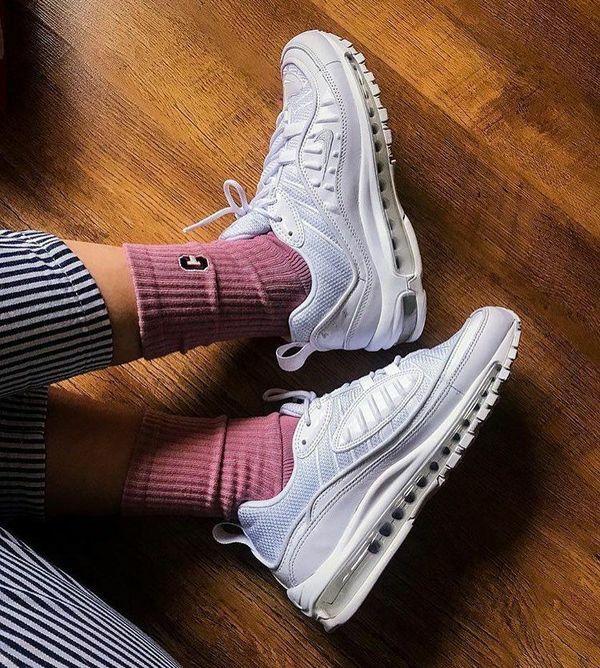 Nike Air Max 98 was created bearing weight in mind, thus it uses a synthetic leather and mesh upper, as well as lightweight midsole construction for weight reduction and maximally natural feel. Visible Air Max units in midsole are one of the most popular Nike’s cushioning technologies. It is perfect for various gym activities, cross training, but is probably not enough for long-distance running. Mesh upper and breathable lining of the Nike Air Max 98 provide better air circulation and moisture management to give you comfortable odor-free workout experience. The Air Max 98 features synthetic overlays on the upper, which keep your feet in secure position. Also, the shoe has external lace overlay system, which is the two lace loops located at the forefoot – this provided an optimally locked-in fit. And the adequate space in the toe box allows for a natural toe splay, reducing the risk of injuries. Such small detail as the heel pull loop helps you put on and take off the Nike Air Max 98 effortlessly, just like a slip-on shoe. Removable insole is always a great idea: you can easily change the insole for another orthotic, which you’re used to and enjoy the comfort and support of the shoe. Max Air Technology is designed to provide maximum impact protection during repetitive landings. Shoes with Max Air technology feature less midsole material and larger-volume airbags for lighter weight and maximum cushioning. Max Air Technology absorbs impact forces and immediately returns to the original shape. Also, it’s designed to meet various athletes’ needs in terms of training specifications. Finally, this cushioning technology is made durable enough to provide cushioning throughout the sneakers’ life. Nike Air Max 98 makes a huge comeback this year after 20 years of silence and the experts believe it’s gonna be much more successful than in 1998. Most sneaker fans have already chosen their favorites from multiple Air Max 98 colorways. Wanna grab yours? Hurry up as new releases get sold out very quickly!